The proposition was preposterous, even for Doug Pederson. Pederson contended last week that the Eagles who hadn't played much, or at all, in the preseason would be just fine in the season opener against the visiting Falcons. He was serious. As it turned out, he was also right. Jay Ajayi ran for two touchdowns. Nelson Agholor caught eight passes. Brandon Graham had two tackles for loss and forced an intentional-grounding penalty. Jason Peters dominated all night. You'd think we'd have learned by now. Pederson might look and sound Gomer-ish, but he's astonishingly sharp and pathologically sincere. 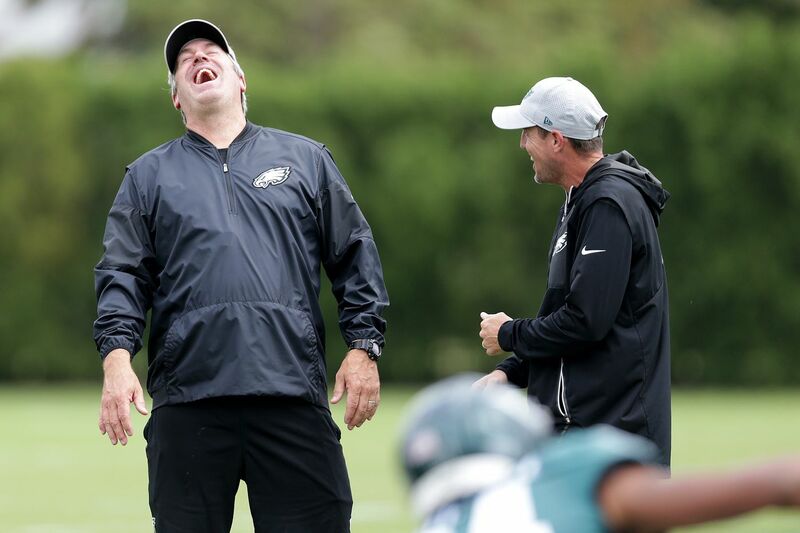 In 2016, before he'd coached a single game for the Eagles, Pederson told us Carson Wentz, the FCS (Division I-AA) quarterback on whom the team mortgaged everything, would be a superb rookie and, quickly, a star. We rolled our eyes and snickered a little bit. Wentz was a rookie of the year finalist in 2016 and was voted the Pro Bowl starter for the NFC last season. In July of last year, coming off a 7-9 season in 2016, Pederson said of his 2017 squad: "We probably have more talent" than the 1996 and 1997 Green Bay Packers, who went 1-1 in Super Bowls and for whom Pederson was the backup quarterback. Again, roll and snicker. Then, two days before the opener, he said preseason games had less value than training-camp practice. Snicker. Roll. In our defense, logic indicated that there would be considerable rust on the absentees. Graham missed the preseason games while recovering from ankle surgery. Agholor missed the preseason with an undisclosed lower-body injury. Ajayi's knees are only 25 years old but they feel like they're 25 years older, and he had a foot injury, so he didn't play the preseason, either. Peters, the 36-year-old left tackle, and running back Darren Sproles, 35, both had surgery last season, too. Peters allowed no quarterback pressures on 37 drop-backs, according to ProFootballFocus. Notably, on the 11-yard touchdown run that preceded his exit, Peters washed out linebacker De'Vondre Campbell. That cleared the way for Ajayi to reach the second level untouched. There, Ajayi bounced off safety Damontae Kazee and surged into the end zone. Like most running backs, Ajayi plays best when he's in sync with his linemen. He finished with 62 yards on 15 carries, but he gained just 14 on his first four. He and the rest of the group played better than even Pederson expected. "As the game progressed, they did," Pederson said. "It was good to get out there on the field, for me especially," Ajayi conceded. "I've been out for those weeks, and I'm trying to find my way back onto the field. It was good to be able to play in this game." So, to be fair to us, the players who hadn't played did need some in-game exposure. Sproles had four catches for 22 yards, five carries for 10 yards and three punt returns for 29 yards. He acknowledged that his timing was off, but he was ready. "Our coaches make practices like a game," Sproles said. "The whole training camp. When we get in the game, we're fine." Darren Sproles runs back a punt against the Falcons. Not completely fine. Peters left the game after the Eagles scored the winning touchdown with 2 minutes, 19 seconds to play. "Just a little fatigued at the end, so we just kept him out," Pederson said. Peters had played 71 snaps to that point, as many as any other lineman and more than any of the other absentees. Graham was an ironman. He had those tackles for loss on the last play of the first quarter and the first play of the second, and he prompted the grounding penalty early in the third. He finished with 46 snaps, most among the four defensive ends. "Just stayed ready," Graham said. "Stayed in condition. Ate right." If we're smart, we'll start asking him to predict things that really matter. Stock tips. Weather. The apocalypse. If we're smart, when he answers, we'll look straight ahead. And we won't snicker. NFL draft: For all the work the Eagles and other teams put into scouting, how can they get top picks wrong?